Read a review of The Database Hacker's Handbook. Read about security products released in April 2006. MOBILE SECURITY Enterprises need to take control of PDAs, smart phones and other mobile devices to ensure corporate security. BITS & BOLTS SSL-encrypted tunnels protect sensitive data traveling the Information Superhighway. 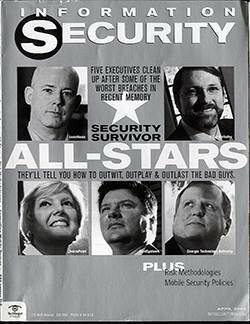 COVER STORY Five security survivors tell you how to outwit, outplay and outlast the bad guys. Network perimeter defenses have crumbled. What we need now are self-defending clients.